Amazing geometry in this one, Stuart! 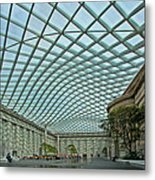 Great capture of this amazing architecture! 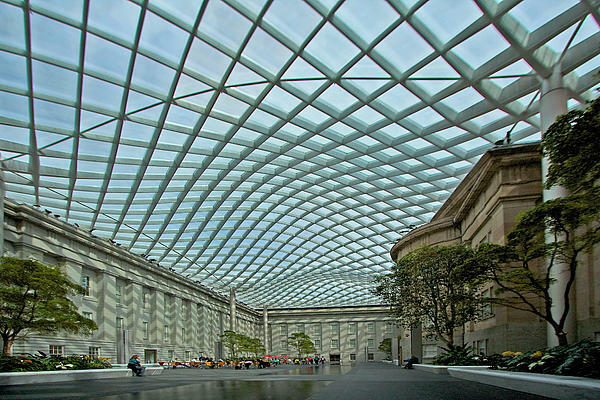 This photograph shows The Robert and Arlene Kogod Courtyard, which connects the National Portrait Gallery with the Smithsonian American Art Museum in downtown Washington, DC. 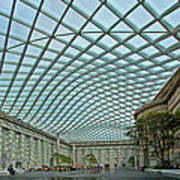 The two museums and courtyard form what is now called the Donald W. Reynolds Center for American Art and Portraiture. 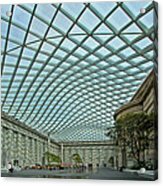 The Courtyard's glass canopy, designed by architect Norman Foster of Foster + Partners, is a wavy glass and steel structure that appears to float over the courtyard, letting in natural light but protecting visitors from the elements. The double�glazed glass panels are set in a grid supported by eight aluminum�clad columns located around the perimeter of the courtyard.